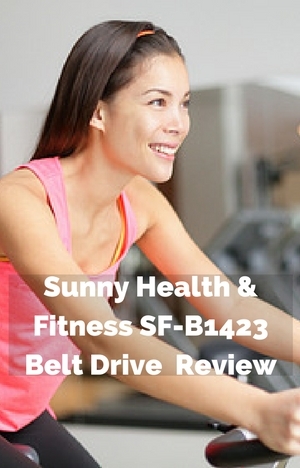 The Sunny Health & Fitness SF-B1423 Belt Drive Indoor Cycling Bike is an affordable priced spin bike. The price is even more remarkable because it comes with a belt drive. It also has a basic console that many spin bikes don’t come with – even the more expensive ones. With a 40 lbs flywheel at first look it looks like it has all the functionality for those cardio workouts in your own home. In my review I take a look at whether this basic affordable bike can give you the workout you want without having to rush to gym or brave the bad weather. I go through both – what is good and what might be cause for concern. The first thing to look at is how stable it is under those intense workouts in and out of the saddle. The frame and stabilizer bars are made from heavy duty steel that doesn’t flex or move around while you exercise whether you are standing or sitting or transitioning in between. You feel like you have a solid base without any concerns of being tipped off so you can concentrate on getting a great workout. Underneath the stabilizer bars are levelers that can be used to balance up the bike if there is some variation in the floor causing it to rock from side to side. It not yet been around long enough to get feedback from customers to see how it holds up. One customer who has been riding it hard says in their review it is doing well. And other customers comment positively on the quality. To me it looks like it will be durable as are their other spin bikes and indoor cycles. You can move the seat vertically and horizontally and the handlebars vertically to get the best and most comfortable fit for your workouts. From customers feedback there is enough adjustments to easily fit people between 5ft 2 ins and 6 ft 4 ins. Although the supplier doesn’t supply information to confirm this. It has said in the product listing that the bike seat can be adjusted between 28 ins and 36 ins from the pedal at its lowest position which can give you some idea of leg length it accommodates (your leg should be slightly bent when pedal is at this point). The handlebars can be adjusted between 38 and 42 ins from the floor. It is quick to adjust each of the positions using the adjustment knobs and sliding the seat or handlebars into position and then tightening the knob to hold them in position. It can be easily used by more than one person. It is more than quick enough so that you don’t feel like you’ve been held up if it has been adjusted since you last used the bike. When tightened up fully you shouldn’t experience any shaking. Setting it up the first time may take a little extra time as you get the positions for your height. To make it quicker when there is more than one of you using the bike it helps to mark the positions on the adjustment pole with a permanent marker. Resistance is provided by a friction pad that sits on top of the flywheel. The amount of resistance is controlled by the tension knob that is on the frame above it. It is done by turning the knob. It is in easy reach and is easy to turn. You can adjust the resistance to the amount you want – it is on a continuous scale. It moves up incrementally so it doesn’t go from easy to hard in one small turn. There isn’t any guidance by way of marked levels to help you set it or return to a previous setting. This is normal with spin bikes with only those with magnetic resistance having marked levels but they are more expensive. The resistance pad will wear down over time so will need replacing which can be done by contacting the supplier. To stop the flywheel quickly you push down on the knob and resistance pad works as a brake. There isn’t a cover or guard for the friction pad or flywheel to prevent sweat dripping on them which can overtime cause damage and gum it up. Wiping this area regularly will help to prevent this. You don’t need any special materials. As the name suggests this bike has a belt drive connecting the pedals to 40 lbs flywheel. It provides a good consistent pedaling motion. It’s very quiet and low maintenance – there’s no lubricating or tightening required as you get with a chain drive. The flywheel weight helps to pull the pedals through the 360 degree motion at all levels of resistance so it feel fluid and there is little choppiness that would make it harder to ride out of the saddle and also add some impact. The bike has fixed gear so that when the flywheel is moving so are the pedals. When you want to stop pedaling the pedals with continue to move due to the momentum or inertia of the flywheel continuing to pull them round. You can either gently slow down the pedals or use the brake to stop it quickly. You do need to stop the pedals to be able get off without being hit by the pedals and possibly being injured. The drive is enclosed which helps to protect it from being damaged and yourself, kids and pets from being injured when it is in use. However, the flywheel is exposed so it is important to keep others away from it when it is in use. The standard pedals come with toe cage and strap. The strap can be adjusted to accommodate different shoes sizes and to help to keep your feet from slipping off. The heavy duty 3 piece crank provides the sturdiness and durability you want when standing on the pedals and there is no flexing or creaking when you are out of the saddle. If you want to change the pedals it has a 1/2 inch (confirmed by supplier) which will make it a little difficult to replace. Seat The seat is described as cushioned and comfortable by the supplier. And some reviews do so it is reasonably comfortable which is surprising for a Sunny bike. But having an uncomfortable seat is not uncommon for an indoor cycle or spin bike just like an outdoor bike. This is because comfort is such a personal thing. If you are one of the unfortunate ones that find the seat uncomfortable you can try a gel seat cover, padded bike shorts or as a last resort you can change the seat. It should fit any standard fitting bike seat. Handlebars. The handlebars are padded to provide a good grip even when hands are wet from sweat. The shape of them with the loop and bullhorns give you plenty of choice of handgrip positions to allow you to follow along to spinning workouts. Noise. It is a fairly quiet bike with just a small hum coming from the friction pad on the flywheel. It won’t disturb anyone in a room next to where you are working out. It is unlikely to wake sleeping children or adults even when used at night. If you are in an apartment it shouldn’t disturb neighbors although you may want to put it on a rubber exercise mat to prevent and vibration being noticed in an apartment below you. When the bike is not in use it needs an area of 20 by 47 ins, which is a good compact size for a spin bike. It won’t take up too much room – it could be stored against a wall or under the stairs (or if you have a large closet). It’s not an ugly piece of equipment so won’t annoy you too much if you do choose to leave it out – its then serves as a friendly reminder to get working out or spinning. To move the bike around it has 2 small transport wheels on the front stabilizer bar that you tip the bike on to by lifting the back. It’s easy to lift and move. Most of the weight is at the front of the bike so you just need to wheel it around. The wheels are wide apart so it shouldn’t tip but it does pay to exercise some care. The wheels will work on most surfaces. You may find them sticking on soft carpet or those with a deep pile. Also if you have a wood floor you might want to check that the wheels don’t dent or scratch it before moving the bike all the way across it. The bike comes partly assembled. The hardest parts of it have been done. Many get the job done in less than an hour. It involves in adding the stabilizer bars, seat, handlebars, adjustment poles, pedals, water bottle holder and console to the bike. It includes the tools you need to complete it. They are good enough to get the job done but you may want to use your own to make it easier for you – you’ll want an adjustable wrench and Phillips screwdriver if you have them to hand. The bike comes with basic control that allows you to track your progress while on the bike. It measures time, distance, calories and speed. It doesn’t measure RPM or your heart rate. It displays one of these at a time or you can set it to rotate through them every few seconds. To change these you press the mode button below the screen as needed to scroll through the measures to the one you want and then it is locked in place. The console is powered by 2 AA batteries. To start it up you start pedaling and it turns off after 4 minutes of no activity. You do need to workout in good light conditions if you want to see the console display as it isn’t backlit. You need to come up with your own workout plans as there are none included in the console or you can check out YouTube or find a free App for your programs so you don’t have to think up your own. The measures are good for tracking your workouts but apart from time they aren’t accurate – they are general estimates. For example, the calories burned doesn’t take into consideration resistance or your weight. There is no facility for recording and analyzing your results – this needs to be done manually. Also, there are no pre-set workout programs to help structure your workouts. You’ll have to come up with your own or follow a DVD or YouTube video. It only comes with one accessory and that is the water bottle holder. It’s on the side of the front support out of the way of too much sweat and you won’t knock while you ride or getting on/off the bike. It can be easily reached while cycling but you do need to bend down to slide it in and out so you may need to slow down. The manual doesn’t provide guidance on workouts or what is the proper set up for the bike for a proper fit. You need to do find this out on your own. For a bike that’s great for beginners it would have been a good idea to include this. Resistance pads needs to be replaced every 6 to 12 months depending on usage. Resistance levels aren’t marked to help you set the amount you want to work at or return to – it has to be done by feel. This has a very good (excellent) rating from customers with 91% rating a 4 or 5. It might not have the number of reviews of other bikes but it’s certainly off to a great start. It seems it is carrying on the good ratings received by other Sunny Health & Fitness bikes. There are a couple of isolated reviews where people have received a bike with quality control. But they do appear to be the exception compared to the vast majority of people leaving a positive review. There are some who don’t like the seat (to be expected) and some concerns that the console doesn’t measure RPM. That aside they are positive with the bike – very much liking its performance especially when they consider the price. They like the quality of the bike finding it very high with some comparing favorably to bikes you get at the gym. For the price you get a lot with it coming with a good weighted 40 lbs flywheel, belt drive and basic console. The fact it is considered to be good quality by customers makes it good value for the money. And it normal for a belt drive to be seen on more expensive bikes. Although Sunny does do a good range of affordable bike – this looks a good price compared to those. The other most popular the Sunny Health & Fitness Indoor Cycle with 49 lb Flywheel that comes with a belt drive and of course a 49 lb flywheel but without a console costs about $60 more. It will have a more consistent and smoother pedaling experience particularly at the higher levels of resistance. These are both good bikes and both represent good value but you are paying more for what is some improvement of the pedaling motion. The Sunny Health & Fitness SF-B1423 Indoor Cycling Bike can be used by beginners and more advanced exercisers too. The friction resistance can be turned down to almost none and up to as hard as you want. Its quiet and sturdy allowing you to workout when you want without disturbing others at anytime of the day or night. I like that it comes a basic console (It would be better if it measured RPM) that helps you keep on track during a workout. The 40 lbs flywheel provides the inertia to help pull the pedals through the whole pedal cycle keeping it low impact and reducing choppiness you get with lighter flywheels. Also it can be used by multiple users due its quick adjustments to the seat and handlebars. For the price this bike it is hard to beat – with a good solid workout that is smooth and fluid, allowing you to get on with your workout to work on your fitness goals. Yes it is a good price for the bike at the moment. You may fit the bike depending on your leg length. The minimum distance at full extension is 28 ins. I’ve not tried pedal blocks or know anyone that has but the supplier says they fit exercise bikes. Here is a link to them Sunlite Pedal Blocks. You’ll have to remove the toe cages and straps. The Spin bikes abd Indoor cycles for short people are here – but don’t have the belt drive and price together. That’s all I’ve got. I hope it helps a little. Marcy don’t have a belt drive indoor cycle. Thank you very much for this thorough analysis. I have been stressing my purchase after spending countless hours researching and this review has helped me make up my mind. Keep up the great work! You’re welcome. Great to hear it helped.